As a parent, there is nothing better than introducing your children to things that you loved as a child, and watching the amazement on their face as they likewise are enamored by that same thing. Or not, as may be the case. In fact, as always seems to be the case. That is to say, if I loved something as a child, it is almost a certainty that my children will abhor it. Now, in both my and their defense, things like technology have come a long way in my thirty or so years (#liar!). With movies, for instance, special effects have evolved to the point where it is almost impossible for my kids to enjoy the same movies I loved. When I staged a screening of Pete’s Dragon for my children, my hopeful enthusiasm that they would cherish Eliot and Pete’s friendship as much as I did quickly went south when they started laughing in all the wrong places. Same thing with Bedknobs and Broomsticks and The Shaggy D.A. But they are vintage, I explained. It was a simpler time, you have to ignore the grainy picture, the poor acting, and the strange voice-overs. They choose their movies now. I moved on to books, and enjoyed a small window of success. I introduced my charges to The Paper Bag Princess and Where the Wild Things Are, with huge fanfare. When they asked me to reread these at night, my confidence in my tiny self was restored. Oh yeah, who’s your momma now? As a fan of books, my kids are used to me shoveling them down their throats. I know, I know, I should back off, let them come to titles on their own terms, but I can’t help myself. YOU. MUST. LOVE. THIS. My enthusiasm gets the best of me. I can’t be tamed. Yet with certain things I truly obsessed over loved, I tried to take a more delicate path, in order to ensure success. Since I know from past experience, when I return from the library with an armload of books for my kids, I’m met with three eye rolls, I have purposefully kept my lips sealed about the best book ever written for adolescents. 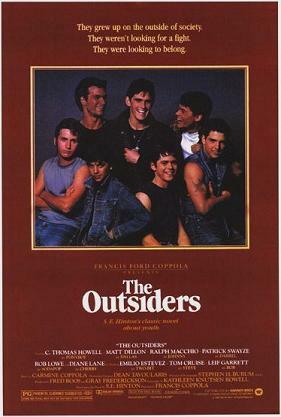 The Outsiders, duh. I speak for the generation of teenagers who listened to Kool and the Gang when I explain what The Outsiders meant to me. 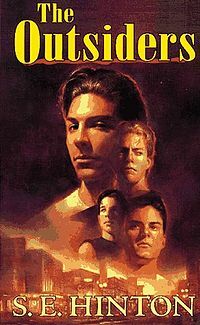 Despite never knowing how to properly pronounce The Socs, this book, about a family of orphaned boys and their peers, the Greasers, stole my heart and my imagination and made me pine for chocolate cake for breakfast. I went on to read every book S.E. Hinton ever wrote and wore out our Betamax machine replaying Francis Ford Coppola’s movie adaptation. Ponyboy, Sodapop, and Dally, ripped from Teen Beat magazine, adorned my walls. I committed half of the screenplay, including Robert Frost’s poem that Johnny reads, to memory, and in times of trouble I quietly utter, ‘stay gold, Ponyboy,’ which has been met with quizzical looks. This gem of a book I’ve been saving, wanting to offer it to my own flesh and blood at just the right moment. Several times I held it in my trembling hands in the library, only to kiss it and replace it on the shelf. It’s not time, said a voice in my head, similar to Darth Vader’s. Then, goddammit, the school system stole my thunder, and my daughter brought it home for required reading – required reading being the kiss of death for any novel. (Note that the school telling you to read a novel and your own mother telling you to read a novel are radically different.) It took me years to come around to Charles Dickens after being force fed Great Expectations, so I can relate. But surely, reading a book with your mother hanging over your shoulder, you know, just in case you had any questions about the context, or a need to expand and discuss on the themes presented, would only help someone enjoy it more. There is nothing worse than ambiguity, after all. I made myself available. So, I asked her once or twenty times, what do you think? She looked at me with one of those looks. I backed off, but noted her progress, and when she neared the end I begged suggested we read it together. Savour the moment. Surely, this would be her ‘aha’ moment. We snuggled in bed with the book between us. I bawled openly. She looked at me with a new strangeness. Through my tears I tried to bestow the magic that the book itself failed to reveal. S.E. Hinton couldn’t make her love it, but surely I could. I know, right, so…. perhaps it is purely a generational problem. Let’s blame it on those damn cell phones, why not?! You are absolutely correct and your children are all wrong. BEST BOOK EVER! I love you for more than your ability to consume wine, my kindred spirit.